About a week ago, we made a short trip for a visit to Monterey to visit Stuckie & Yoko, our friends at Munktiki. It was awe-inspiring to see shelf after shelf of beautiful white unglazed tiki mugs. We got a sneak preview of some of the new design ideas in the works, and got to see Paul’s (that’s Stuckie’s dad) new CaveTiki designs, which looked incredibly difficult to make, but with beautiful results. After visiting Munktiki, we had dinner at Hula’s Island Grill & Tiki Room, which was a first visit for me. I’d been wanting to check Hula’s out for some time, but to be honest I didn’t have high hopes — I’d figured that the locals loved it because it was all they had in terms of tiki, and what I’d seen of it in pictures led me to believe it was more of a rinky-dink Hawaiiana joint. I was beyond pleasantly surprised — this place is fantastic, and one of my new favorites! First of all, the food is amazing… and on top of that, they make a proper Mai Tai! We were surrounded by bamboo and cozy traditional tiki details, with carvings & black velvet repros all over. This restaurant is the first time I’ve encountered both food and drinks that are top-notch. I only wish it were closer. We spoke with one of the owners, Chris, who indicated that he’s a big fan of the Mai Kai, and wants to open another restaurant in a new city that is like Hula’s, only more tiki and more elegant. I’m crossing my fingers in the hopes that he’ll pick a city near me. After dinner, the four of us ventured to the Carmel Highlands to visit with my friend Kevin (a.k.a. Unga Bunga) at his home tiki bar. Another pleasant surprise! Lots of neat water features, great music, great company, a lovely evening all around. To top off our Monterey adventure, we picked up a San Francisco Tiki Bob mug at an antique mall the next morning on our way out of town — we paid a bunch, but less than we likely would have on eBay. Score! 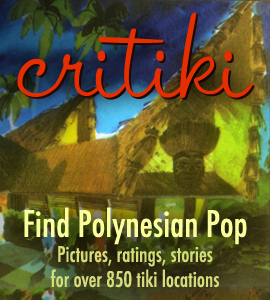 TIKI’s wow, I found your BLOG by searching “Hollywood” – I have an art gallery directly across from Hollywood Forever ADM PROJECT, and I live in Monterey, and I use to live in Hawaii as a kid back arround 1979 or so….browsing your TIKI site brought back a lot of memories!!! Previous Previous post: Trader Vic's Chicago Closing?